Robotics and Computer Vision Laboratory was established in 1993 to analyze the cognition capability of the human visual system and to develop high-performance computer vision system. We have succeeded in developing and commercializing many automatic systems, and have developed vision systems for intelligent mobile robots and unmanned vehicles. 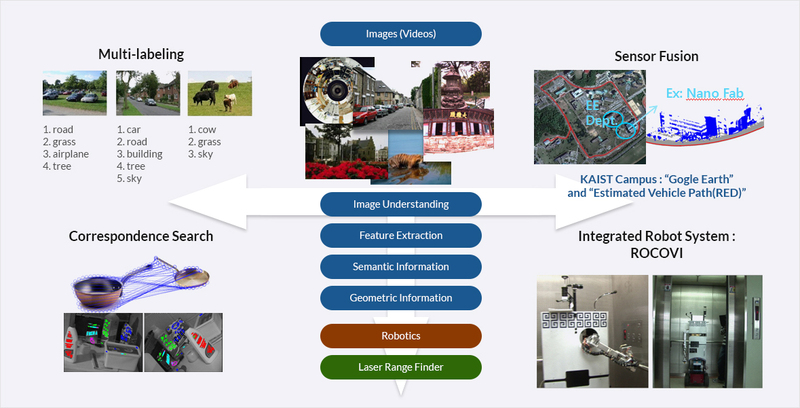 We research and apply features to intelligent mobile robots for robust robot vision. Besides, we also research robot localization technology based on vision for network-based intelligent robots and embedded system technology to commercialize our vision systems. In addition, we are doing various tasks related to national defense and developing vision system in cooperation with some companies simultaneously. Prof. In-So Kweon was appointed as an assistant professor of the Department of Automation and Design Engineering, KAIST in Seoul. Prof. In-So Kweon went to Cambridge University as a visiting professor. The laboratory moved from Seoul to Daejeon. Prof. In-So Kweon received a research prize of KAIST. Ph.D. W.H.Lee was invited as a BK researcher. Prof. In-So Kweon served the IPIU as the organization committee chair. Prof. In-So Kweon was promoted to a professor of KAIST.